Tonight for dinner is Mexican taco bowls! YUM! Who supplied me with some of the stuff I needed was BzzAgent for free! I qualified for their campaign to try out Old El Paso Stand N Stuff Soft Flour Tortillas and Mexican Cooking Sauces (Roasted Tomato and Chile & Roasted Garlic). I wanted to do taco bowls using ground beef that I had to supply myself. 1. Cook 1 lb ground beef until it's no longer pink and drain any oil. 2. I poured in the Roasted Tomato Mexican Cooking Sauce in the ground beef and also added a bit of my own seasonings (a table spoon of garlic powder, a table spoon of taco seasoning, and a bit of garlic minced pieces) to give the flavor a bit of a kick because the cooking sauce alone was a bit bland. I covered the top of the meat and let it simmer on low heat. 3. I put 4 Stand 'N Stuff Flour Tortillas on a cookie sheet and place them in the oven on 325 degrees and let them cook for 5 to 7 minutes. 4. I cut up lettuce, tomatoes, and onions in a bowl. 5. I took out the Stand 'N Stuff Flour Tortillas from the oven and also removed the taco meat from the stove. 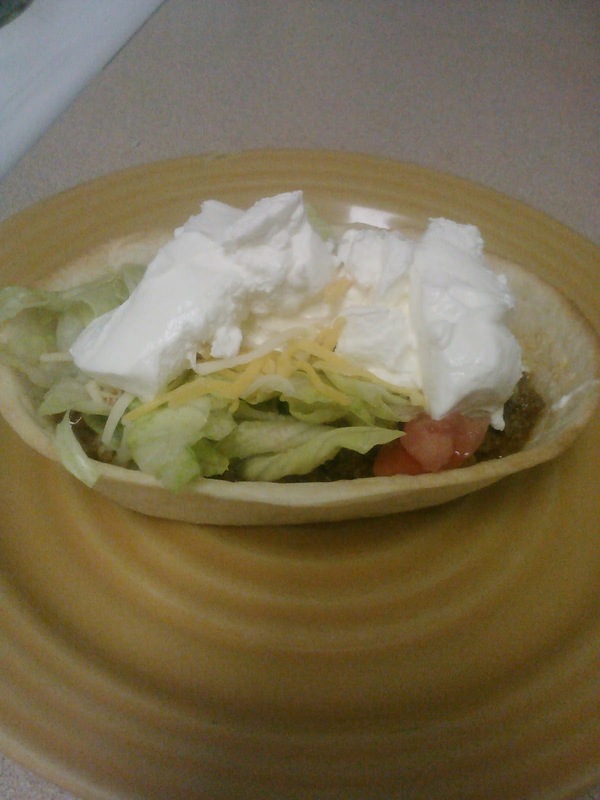 I added the meat in the tortilla bowls and added the lettuce, tomatoes, onions, and also sour cream and shredded cheese. Cooking Time Total- About 20 minutes. My food turned out great! Very delicious and full of yummy Mexican flavor! 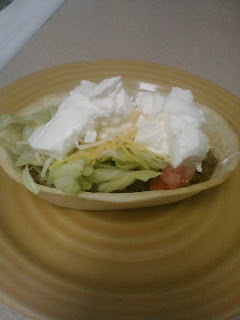 Also this dish is kid friendly and didn't make a mess when my kids ate it- unlike regular taco shells that falls apart. I asked my daughters if they'd enjoyed their meal and they said yes! My oldest daughter (age 7) loved her taco bowl that she even requested for second helping. My youngest daughter (age 6) liked the meat but not the flour bowl since she already does not like flour shells. 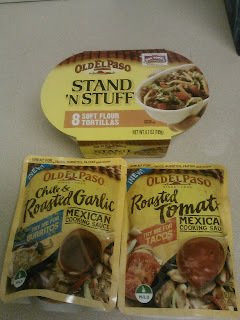 Is Old El Paso Stand N Stuff Soft Flour Tortillas and Mexican Cooking Sauce Worth a Try? I really liked both sauce for tacos and the flour bowls. I just wish the sauce had a bit more seasoning to it for better taste but I guess that's ok because everyone's taste buds are different. I can't wait to try out the other sauce I received free to make burritos! Also you can make fajitas and more!